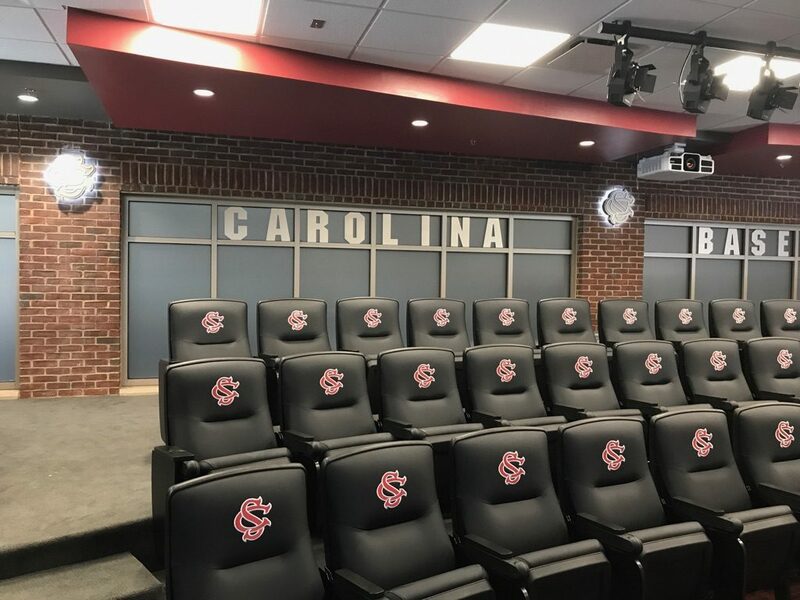 Gamecocks now have privacy shades for football recruiting room at Williams-Brice Stadium & impressive backdrop for baseball press conferences. 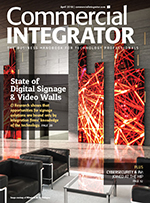 When University of South Carolina officials wanted Elite Audio to update the football recruiting and conference room inside Williams-Brice Stadium and the baseball media room at Founders Park with printed shades to provide specific backdrops, they knew they wanted a solution that would help them continue their legacy of athletic excellence. 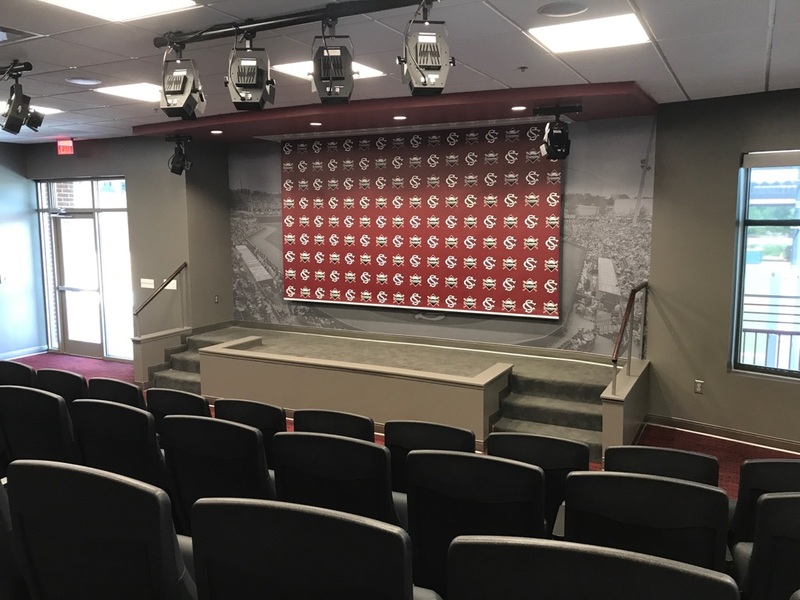 For the football recruiting and conference room, which overlooks Williams-Brice Stadium, the objective for the new backdrops was to provide privacy, particularly to cover the white boards in the room, especially when recruiting was happening. At Founders Park, one printed shade was to provide a background for press conferences and interviews. Officials stressed to designer Elite Audio that both projects had to achieve high aesthetic appeal attain the “USC feel,” as well as be functional and fit effortlessly in the spaces when not in use. Elite Audio, QMotion, and USC worked closely to perfect the design and installation of the QMotion QIS hard-wired shades, which feature hard-wired motor controls that work through the room’s AV system. The shades were custom-made for each space from the step-and-repeat pattern of USC’s logo for the baseball team’s media conference room to the personalized designs, mixing images and texts – such as “Discipline” and “Effort”– for the football recruiting room. Elite Audio and QMotion were also able to work around the challenges of installing in a pocket situation in the recruiting room. There was no wiggle room in the space, so precise measurements and installation of the brackets were crucial and had to be executed flawlessly. The hard-wired configuration utilizes standard CAT 5e or CAT 6 cables to connect to both the power and communication panel, which benefits in not having the additional expense of proprietary cabling or two separate cables. In addition to the hard-wired shades, Qlink, which allows users to operate a bank of shades side-by-side with one motor, was used in the football recruiting room to give the space quiet operation, energy efficiency and remote control.